Take a Bite Out of Your Monthly Bill! Simply tell us who you think would be a great fit for our service and for each friend you refer that signs up as a Retainer Client such as yourself, you will receive a $250.00* credit on your next month’s bill. *Only one referral credit per month per signed referral. 1. 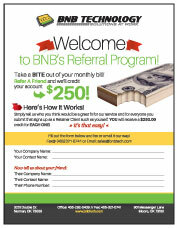 Click on the thumbnail below to download our Referral Program flier and fax or email it back our way. 2. Fill out and submit the form on this page. 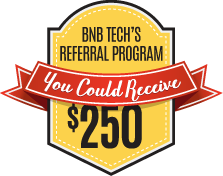 Click the thumbnail to download the Referral Program pdf.